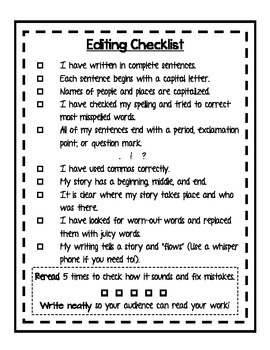 This checklist will encourage students to edit their own writing. This was designed for narrative writing but could be used with any writing assignment. I use this checklist to give my fast finishers something to do while I'm conferencing with other students about their writing. By the time they get to conference, they have already corrected many mistakes, and they are learning to be good writers and editors in the process!